Sri Lanka Cricket has penalised national cricketers for, refusing to travel to Pakistan for the last T20 even as the team’s head coach and another member of the support staff backed down from the Lahore trip over security concerns. Head Coach Nic Pothas and Physiotherapist Nirmalan Dhanabalasingham have also pulled out, Team Manager Asanka Gurusinha confirmed yesterday. It was a decision that some other members of the Sri Lankan team had also taken before the final Twenty20 squad was announced. Trainer Nic Lee is also likely to make himself unavailable. SLC has frozen the players who refused to go to Lahore out of the entire T-20 series, contravening an earlier decision that they would be free to choose without the threat of punishment hanging over their heads. SLC is yet to confirm the possible replacements for the two members of the coaching staff. SLC’s decision on players has angered them. The cricketers have termed the decision “grossly unfair” and said “the board is using them as pawns”, showing scant regard to their concerns. Sri Lanka are down to play the match on October 29 in Lahore, eight years after gunmen attacked the team bus heading to the Gaddafi Stadium where six Sri Lankan cricketers were injured. At a press conference in Colombo ahead of team’s departure to UAE for the current series, SLC CEO Ashley de Silva said the players would not be penalised if they decided not to travel to Pakistan but added they were contractually bound. A few days later, 40 contracted players including skipper Upul Tharanga expressed their unwillingness to travel to Lahore and wanted a venue change. Notwithstanding the player concerns, the board–satisfied with security reports–confirmed the tour this week. The board also said that only one squad would be announced for the entire series, effectively shutting the door on those pulling out from the Lahore game to the entire series. “If someone wants to help Pakistan for what they have done to Sri Lanka, there are other ways of doing that without risking country’s pride—the cricketers,” the player argued. With several senior cricketers firm in their decision to not to travel to Pakistan, Sri Lanka Cricket named a weakened team led by Thisara Perera. Among the players who were not considered for selection are Tharanga, Dinesh Chandimal, Lasith Malinga, Niroshan Dickwella, Suranga Lakmal, Chamara Kapugedara and Lahiru Thirimanne. Speaking to the Sunday Times, CEO Ashley de Silva said the board is happy with the security situation in Lahore and that the tour is on schedule. “We have received reports from the ICC and also from Pakistan with regard to security and we are happy with it,” said de Silva. The board will also send an independent security analyst to Lahore on October 25. In 2009, when Pakistan cricket was threatened with isolation due to terrorism, SLC agreed to a tour being promised presidential-level security. 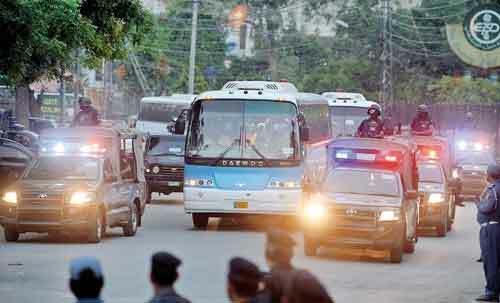 However, in the middle of the second Test in Lahore, near the Gaddafi Stadium, Sri Lanka’s team bus was attacked injuring six players and killing bystanders and security personnel. Ahead of the 2009 visit to Lahore, Sri Lanka cricketers had written to SLC asking for an independent security assessment and insurance cover for the players. SLC responded by saying they had done a security assessment, and that it was fine. But the level of protection offered was so bad that Sri Lanka cricketers were fortunate to escape death. Since then Pakistan, are starved of international cricket. In 2015, a suicide blast outside Lahore’s Gaddafi Stadium killed one person as the Zimbabwe team played against Pakistan in the first ODI featuring an international team since the 2009 attack, showing that the place is still vulnerable. Pakistan recently hosted a three-match T20 series between Pakistan and World XI in a bid to revive international cricket but the memories of that ill-fated tour still linger in the hearts of Sri Lankan players. And a match with a weakened opposition will also do little good for Pakistani efforts to bring back international cricket to the country. In a shocking revelation, Pakistan captain Sarfraz Ahmed has disclosed that he turned down a lucrative offer from a bookmaker in Dubai during the ongoing ODI series against Sri Lanka and reported the matter to the anti-corruption and security unit officials. The incident has shaken the Pakistan team management and anti-corruption and security officials travelling with the team in the UAE, as they felt that the bans imposed on batsmen Sharjeel Khan and Khalid Latif for spot-fixing in Pakistan Super League might have stopped such moves. “The matter has been handled as per standard procedure, but there is a lot of respect for Sarfraz, who as a captain and player, has set a great example for his teammates on how to avoid attempts to corrupt the game,” an official of the Pakistan Cricket Board said on condition of anonymity. “ICC rules don’t allow us to name player (s) in such cases where approaches are reported but yes Sarfraz got an offer and he immediately reported the matter to the concerned officials, who have taken appropriate action,” he added. Incidentally the man who made the verbal offer to the Pakistani captain is based in Dubai and is learnt to be known to the players. An official in the PCB said that the team management has increased vigilance of players and reset curfew timings. “On the insistence of head coach Mickey Arthur, there was a bit of relaxation for the players during the ongoing series in the UAE and they were allowed to meet friends and go out for shopping and dinners but now strict procedures and timings have been enforced again,” the official said. The PCB had already changed the hotel of the national team in Dubai following the PSL spot-fixing scandal earlier this February which rocked Pakistan cricket. The PCB’s anti-corruption tribunal banned Sharjeel and Khalid for five years after both were found guilty of breaching anti-corruption code during the PSL and were sent back home from Dubai.